2/ Lack of blood circulation in foot caused by pressure on the instep / top of your foot. 3/ Excessive pressure on the inner side of your foot from over pronation. 1/ A Heel Raise will lift your calf away from the boot giving more room around the calf area. Just a small raise really can make all the difference. 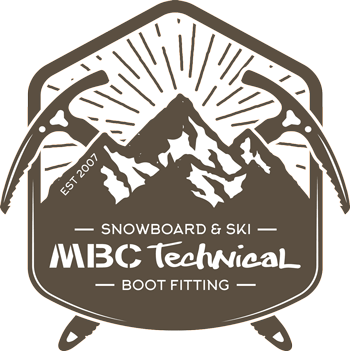 2/ The second reason can be relieved by simply not tightening your ski boots (or snowboard bindings) up too much. You may well have heel lift which is what is making you over-tighten, this is where SHL™ can make all the difference! SHL™ will hold your heels down and mean you don’t feel the need to over-tighten. 3/ You REALLY need to check your footbed. SKI BOOTS: It MUST be a custom made one. It may be that the one you have has collapsed or wasn’t made very well in the first place. If you are a heavier person (90kg+) and certainly if you are an aggressive skier you should go for the most expensive footbed with a ‘cristair’ heel stabiliser (Ask in your ski shop about getting maximum support. SHL™ can help here too. Due to their offset fitting they can help keep the rear foot / ankle area stabilised and actually help reduce over pronation. and actually help reduce over pronation . It is the lack of blood flow to nerves that cause pins and needles which normally goes when good blood flow is resumed.